Central and South America are home to squirrel monkeys. All five species of these small monkeys live in similar ecological environments of lowland tropical forests, edge forests, evergreen forests and logged forests. They live in large social groups and forage for food according to season. Nearly half of the spider monkey diet consists of fruits; the other half varies. 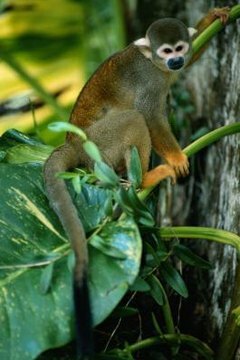 The squirrel monkey is a frugivore-insectivore primate. Frugivore means fruit eater, while insectivore means to insect eater. Some squirrel monkeys have been known to eat eggs and small animals such as birds and bats, which would classify them as omnivores. Typical Eastern Brazilian squirrel monkeys will forage for fruit and seeds in the morning and spend the rest of the day hunting insects. Depending on the amount of fruit available per area, squirrel monkeys may travel over two miles each day, often along rivers and streams in the lower forest canopy. Intragroup competition may erupt as members protect areas in which they are feeding. One monkey, for instance, may monopolize a small but dense patch of fruit, making competition fierce. As few as 18 monkeys may subsist on 1 square mile of forest, or as many as 100, depending on food availability. Squirrel monkeys spend more than half the day hunting for insects. The amount of insects squirrel monkeys consume depends on the amount of fruit available. As fruit declines, more insects get consumed. According to a 2003 study in "Folia Primatologica", squirrel monkeys, in lands studied, ate adult grasshoppers, crickets, butterflies and locusts in August and September; then by December they ate primarily immature insects such as caterpillars. When squirrel monkeys find fruit bat leaf-tents, they attack the tents to eat the bats. They do the same when they find small animals and eggs. Squirrel monkeys display female dominance as females form the core of a group. Dominant members will protect prime foraging areas, not sharing with other members. Sometimes groups of squirrel monkeys will travel along with capuchin monkeys who disturb the upper forest canopy, thus flushing out insects for food. Occasionally, different groups will come together temporarily to feed. Squirrel monkeys in captivity have different feeding behaviors than wild squirrel monkeys. A typical captive diet consists of fruits, vegetable and monkey chow or dog food. Occasionally, mealworms and hard-boiled eggs may be added to the diet. In captivity, boredom can become a problem. Therefore, various feeding systems have been developed to stimulate monkey investigation and curiosity. Feeding puzzles, feeding tubes and feeding baskets are useful for captive squirrel monkeys.